Priced as unfinished Oak or you can order it finished using the drop-down boxes. Finished price will incrementally add to the unfinished price. America's oldest and most popular Three-In-One-Chair. Also known as the Jefferson Chair-Bachelor Chair-Onit Chair. It starts as a chair or stool; people have used it for centuries to sit kids at the kitchen table, to cut the families hair, a kitchen work table or as a bar stool. 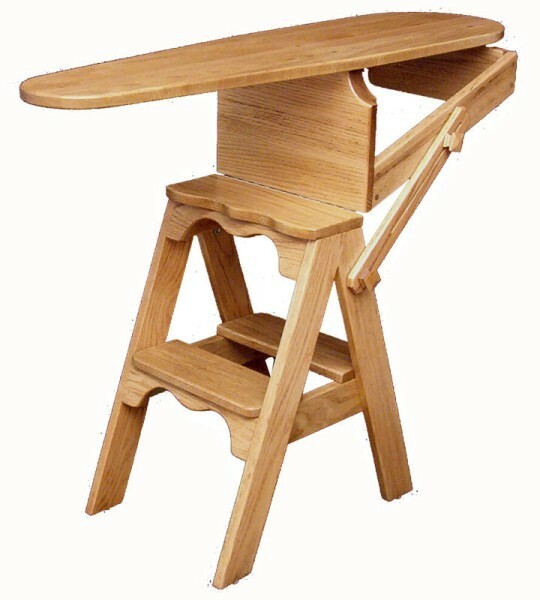 Use it as a step stool or chair without changing positions. Perhaps this is where the name "Onit" originated from as you can do so many different things on it. Flip it up and it becomes an ironing board, flip it on over and it becomes a step ladder. The Ironing Board Chair is the perfect home accessory, even in the most upscale homes. It is ideal in the master suite to reach up to high shelves in the master closets and then to touch up wrinkles in clothes. Use it at the vanity to apply makeup or to fix the granddaughters hair without having to bend over. Use it in the kitchen as an extra chair or bar stool. 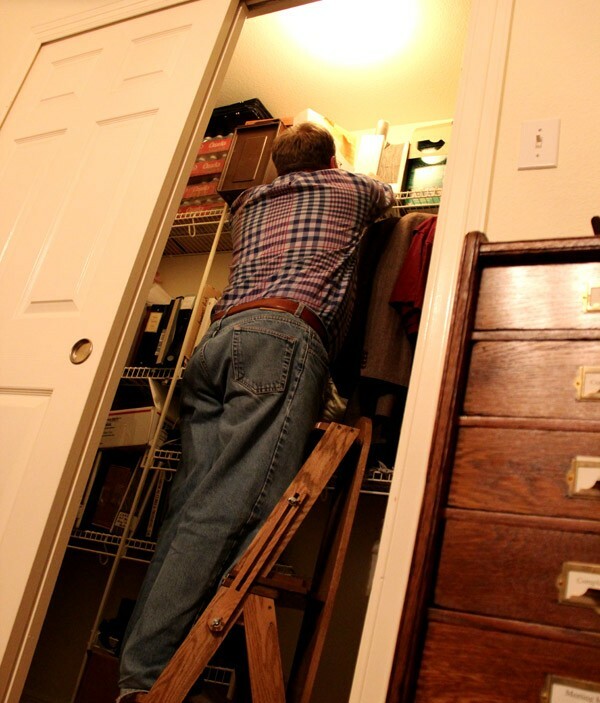 Then have a step ladder available to reach the tall cabinets. Use it as a plant stand, or even as a time out stool. It also makes the perfect kitchen work table, especially when using grandmas’ clamp on apple peeler which, won’t clamp on to the newer granite counter tops. Truth be known many kids depended on it being their easy access to fresh baked cookies on the counter and then reaching up for a glass to top it off with milk. It's a perfect item for RVs and motor coaches. In a very small space, you will have a ready step stool to wash the windshield. 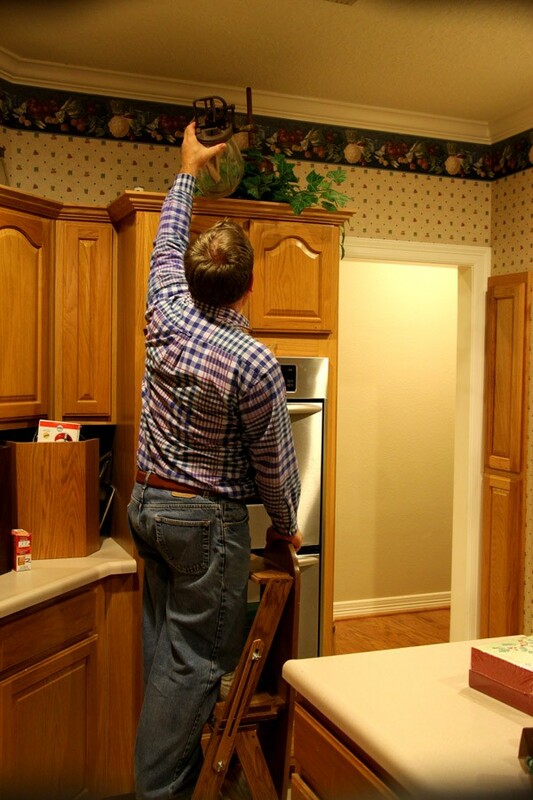 Make it a ladder to work on canopies, have an extra bar stool or chair, then an ironing board for a quick touch up of so-called wrinkle-free clothing. Even use it as an extra worktable for outdoor camping. The Ironing-Board-Chair is even perfect for a small college dorm space. The overall measurement at the base is 13-1/2” wide and 20” deep. 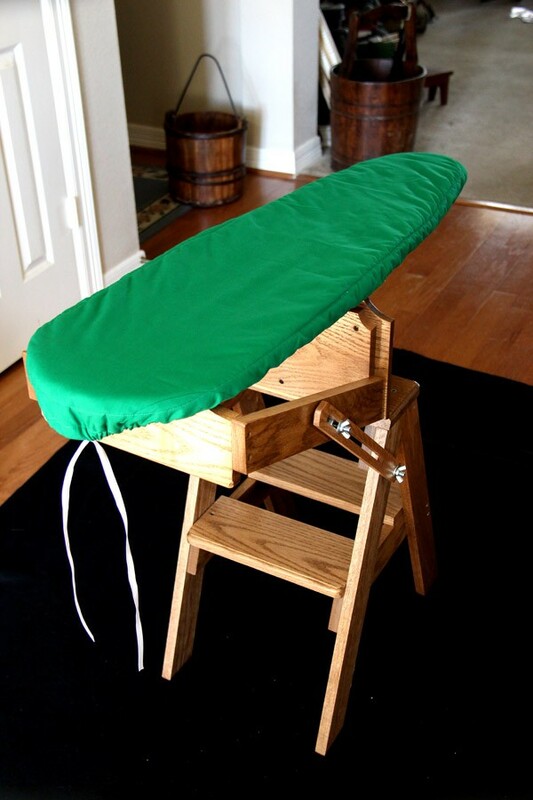 The seat on the chair is 23” high; with a footrest down 11” that is also 12” from the floor, the ironing board folds up to a comfortable 32-1/2” working height and the ladder folds up to 38” tall with steps at 12” and 26” off the floor. When homes were small and furniture was limited people looked for simple items that took little space but could be used for different purposes. The Ironing Board Chair fulfilled that need and over the years it has been resized but the basic design has been maintained. A strong piano hinge keeps the folding part solid and strong. Our Ironing Board Chair ships in a smaller box at dimensional UPS rates. It is just too cost prohibitive to ship this size of chair fully assembled. The base and the top will come fully assembled with one side of the piano hinge already fastened. You will need to secure the other side of the hinge into the predrilled holes on the base and add the sliders. 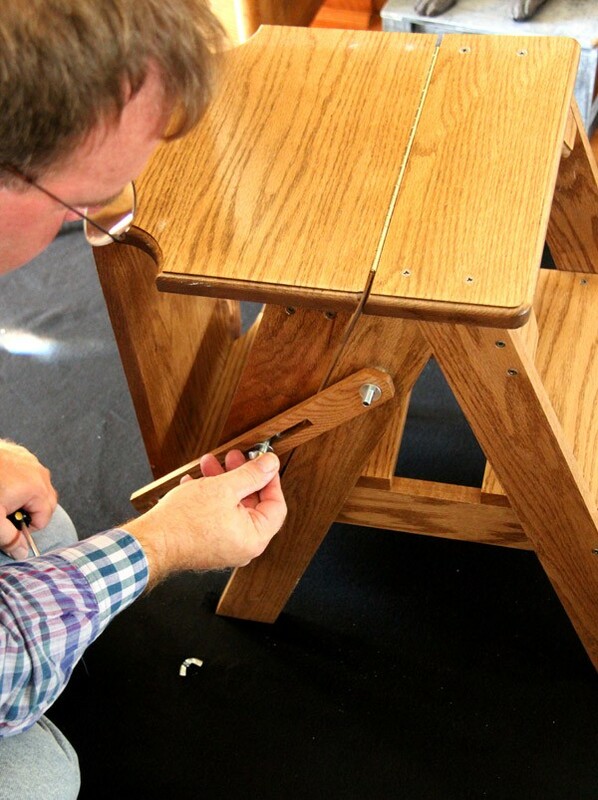 Assembly tools (not shipped with the stool) will require a small Phillips head screwdriver or a screw gun. The Ironing Board Chair comes unfinished or you may select the following finishes using the drop-down boxes. Choice of natural oak, medium stained oak, or dark red stain oak. 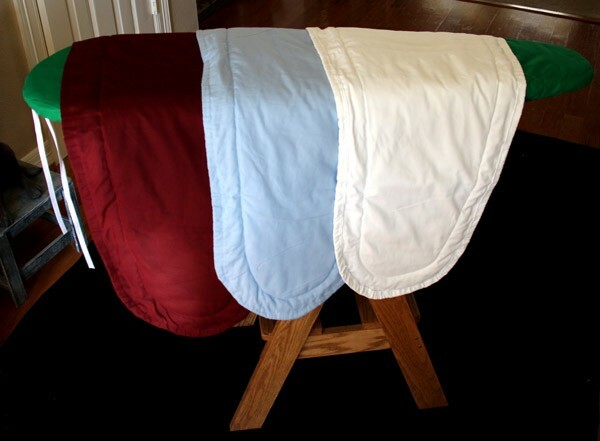 Optional ironing board covers are also Amish handcrafted made from a heavy cotton material with batting to keep the high heat away from the wooden top. The cover uses a simple drawstring to snug the cover over and around the top edge. Color choices are white, blue, green, or burgundy. (Please note the blue will be a shade darker than pictured on the site). Our Amish craftsman custom builds each Ironing Board Chair per order. Please expect a 3-4 week build-out period before your chair is shipped. International customers: We are sorry but the box size is still too large to ship USPS Priority Mail.